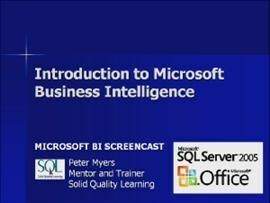 This first screencast will take you through the Microsoft BI Platform briefly touching on each of the technologies. Additional screencasts will be published under the "SQL+Server" tag so subscribe to it now! We are really interested in your feedback on these screencasts. Wow! What a great overview of Microsoft BI. Thank you for putting this series together. Is Performance Point a replacement for ProClarity? This is a really good question and is asked frequently… In order to answer it correctly I wanted to get the answer right from the Performance Point Product team. Here is their response. ProClarity Analytics Server 6.3 will continue to be a component that will be shipped with PerformancePoint Server through the Office 14 timeframe. In addition, ProClarity Desktop Professional 6.3 will be available for license off of Volume Licensing through the same timeframe. We intend to develop outstanding functionality found in these two products into future version releases of PerformancePoint Server and Office. As mentioned this is a great overview. I've read quite a bit about the BI from Microsoft over the past few days and to see it in action really hammers home the capabilities. A few things to highlight that I particularly enjoyed seeing were..
2) Business rules being set in the SSAS portion of the screen cast. I cannot wait to watch the rest! Well, I admit that I am new to all this but I absolutely could not get any of the BI presentations to play. Nada, zip. Restarted, reloaded....nada. Little orange bar trips across about 1/4" and sits there.